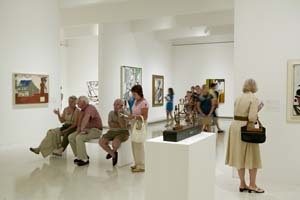 Last night was the last Target Free Thursday Night before the Picasso and American Art exhibition closes on Sept 9th and people were coming in droves to see the work of the master. We had decided not to give Picasso tours that night because the galleries were too crowded, but it was clear that the people in the lobby were there to see Picasso, and so we came up with a quick Plan B (or “ Plan P” as it were…). So we gave the 40 or so gathered folks a choice: Go on a tour of contemporary paintings in the permanent collection as a prelude for seeing the Picasso exhibition (about 10 chose that option), or stay for a brief overview of the Picasso show before heading up to the special exhibition galleries. What to say in five minutes or less to help people make sense of the exhibition, which is really about a handful of avant garde American artists who felt compelled to react to the inventive styles of Picasso? We came up with “ Find the Picasso.” As you enter each section of the galleries, look first for the embedded work by Picasso. Then compare and contrast that work with the works by American artists surrounding it. You remember “ compare and contrast” from your art history 101 course, right? Look for how American artists pulled strategies for abstraction, riffed on subject matter, paid homage to Picasso, and took it to the next level. You will impress those around you with your insights and pithy observations. And who knows? You might wind up being an ad hoc Picasso tour guide on your own.